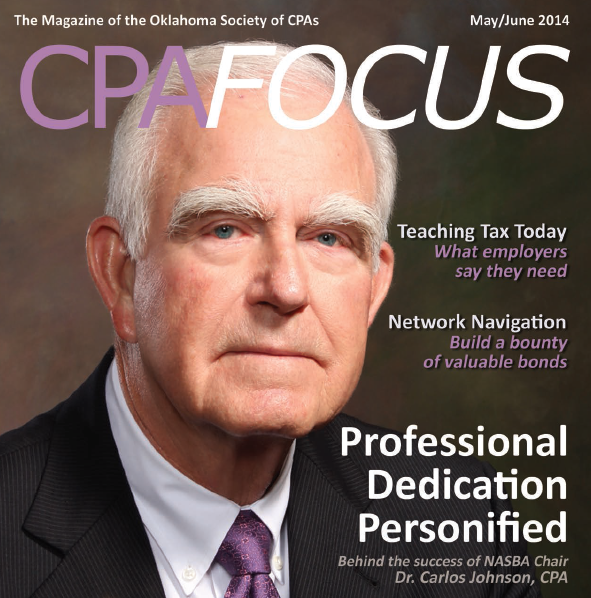 NASBA Chair Carlos Johnson, CPA, Ed.D., was recently featured in CPAFocus, the magazine of the Oklahoma Society of CPAs (OSCPA). In the article, Johnson discusses what it was like to grow up in Wilson, Okla., a small town boasting a population of about 1,700 people. In addition to sharing insights gained as a respected educator, he also talks about how his experiences serving for the OSCPA and the American Institute of CPAs (AICPA) led him down the path of service at NASBA. At NASBA, Johnson has chaired the Uniform Accountancy Act Committee, the State Board Relevance Committee, the State Legislative Support Committee, the Audit Committee and the Special Task Force for the Implementation of Substantial Equivalency. He eventually climbed to vice chair before acceding to chair this year — only the second time an Oklahoman has served as NASBA chair.